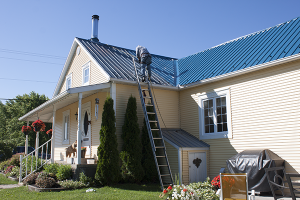 If you get the opportunity for painting a tin roof you can give it a try, or leave it to the professionals. When working on a roof always be careful as a slip or wrong step can lead to a lot of hurting. 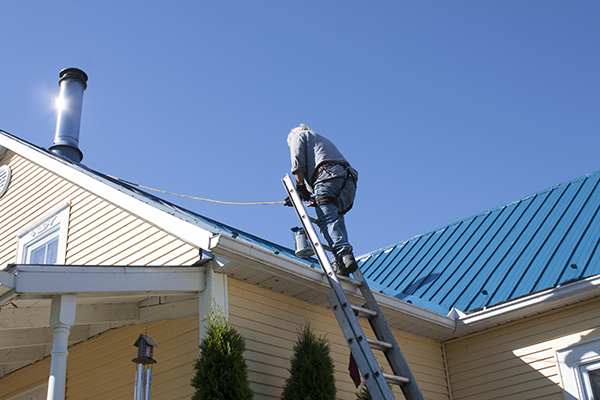 If your roof is rusty with old paint peeling off, then it should be scraped first. A wire brush and paint scraper works well for this. Its a slow process and I have seen pressure washers used also, but in the end there always seems to be scraping by hand to do. Also when your scraping carry a hammer and drill along for any loose nails to replace them with the roofing screws. If you see the tin is loose then it is often better to put screws in, and also where the tin overlaps. This will help anything from becoming loose in the future. Once you have the roof scraped, then its a must to sweep and wash the dirt and dust off before beginning to paint. Pressure washer or garden hose will work well. Some paints recommend a primer before the top coat, while others don’t require it. Other paints will recommend two coats for best results. The one thing when picking up paint for your roof is to always search for the best quality as you don’t wont to be redoing it in a couple years from now. The next thing is how you wont to paint your roof, spray it on or use a brush or roller. I have seen some spray painting done on roofs that were not very good quality, and some that were excellent. So would recommend if your having it sprayed to do your homework first on this subject. If you decide to go with a paint brush then it will certainly take longer then the spray painting, but will most likely be a good job also, and last a long time. A four or three inch brush will work well for this. Another thing you could try is using a fluffy paint roller to do the roof, if it is fairly straight going. Having tried this and to my own surprise it worked quite well. For this is best to work off scaffolding if using a roller, and also to have a long expanding paint pole. With the thick roller is quite easy to get a good paint coverage on the ridges of the tin. It will take about half the time to put on in comparison to using a brush, plus moving the scaffolding also. If your using a brush you can use a roof ladder or climbing harness with good ropes to tie you on with. If the roof is not to steep then the climbing harness and a good rope work very well. Once again would like to mention always be careful and work safe on a roof. Tie up your ropes to something solid like a tree, car, or truck as it can get real exciting sliding off a roof on a ladder with a paint can in your hand. If you try this project out your roof should look real good when finished, be careful, have fun and enjoy the view. 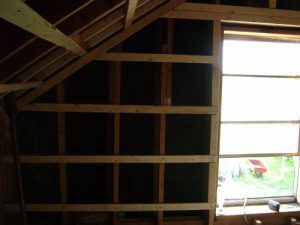 If your stripping a room with one by three furring strips for drywall, they are usually placed at sixteen inch centers. Also making sure the last one at the four foot mark is centered. Many of the old farm houses will have sloped ceilings. If you wont to install a light in your ceiling, then just run a two by six across the center of the ceiling. This then gives you a place to anchor your light box so it wont be sitting on an angle in the ceiling. This also gives strong support if in the future a ceiling fan would be installed. With the sloped ceilings in the room there is very little space to build a closet, so what I have done in this situation is at the three foot level on the slopes you can build either three levels of drawers, or put in shelves. 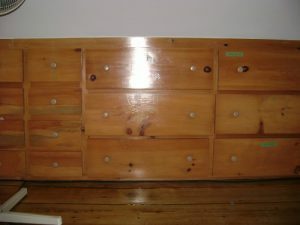 The drawer idea requires a lot of work to make, as it means making a frame work for the drawers where the drawer slides will run, and plywood for the drawers themselves with a face of pine or any type of wood you prefer. Once finished will look great and give lots of room for storing clothes or anything else. The shelf idea is quicker to make, just cut a piece of three quarter plywood, and fit it in at the height you wont. Or you can even go for drawers and shelves. So at the same time that your doing the stripping you can take these things into account for what you wont to have for a closet space. Also as your doing the stripping you will wont to mark where you wont the electrical outlets in your room. Best to install the boxes for that, plus the wiring before the insulation is put in. The electrical boxes are attaches with screws , and flush to where the drywall will be. The wiring is usually put through the two by sixes or two by fours that the walls were originaly built with drilling holes through these for the wire to pass through. One wall in this bedroom was the original brick of the old farm house, so in order to strip over it you can nail a two by four unto the floor at the bottom. Then at the ceiling another two by four is nailed to the rafters. In this case with the room being small the two by fours were nailed on there flat in order to give more room on the stairwell. After the other two by fours are in place then the one by three furring strips are added every sixteen inches up the wall for the drywall. 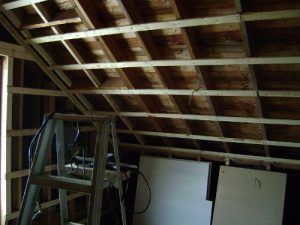 Once you have all the stripping put on and the electrical boxes for plugs in place then next would be your insulation. Many people today are having the foam sprayed in, and it does give an excellent insulation and no air leaks. Over the years I have seen when the fiberglass insulation is installed in walls and ceilings the mice and squirrels will tear it apart for there nest, leaving your walls and ceilings rather poorly insulated, just something to think about. If you have any windows in the room be sure to add the furring strips all the way around the window, so it gives you a place to nail your window trim to. Also when installing your drywall on a ceiling it is a good idea to put short pieces of the one by three furring strips between the sixteen inch strips where the joints in the drywall meet. I have had to patch quite a few ceilings because of cracks showing up where the joints are and this is most often the cause. If you ever have to repair any of these cracks that appear in the ceilings and walls just take a knife and cut a v where the crack is , then tape it and apply a coat of a product called Durabond 90 which prevents cracks from appearing again. It takes about an hour and a half to dry then smooth over with joint filler and a light sanding when dry and your ready for primer paint and a top coat. I have also used the durabond to patch dog and cat scratches on the wood work beside doors, it seems to work really well for this also. 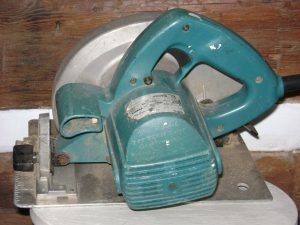 For all the cutting of the furring strips and two by fours am still using a Makita circular saw seven and a quarter inch, as its one of those tools that just keeps on running. Highly recommended if your ever looking for a saw. Well I hope this gives you a few ideas on installing the one by three furring strips before you get prepared to put the drywall on. 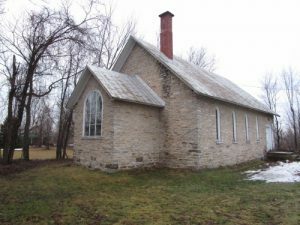 This church had not been taken care off for a good length of time, and the stairs for church basement had rotted away on the bottom of the stringers. 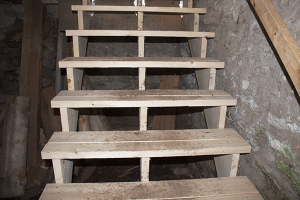 The old stairs were more of a ladder then anything else, and very difficult to go up and down. They also went down so that you had to walk into one of the walls, not good. 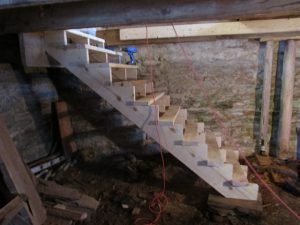 The best thing to do in this situation was to take the old stairs right out and replace with new ones that would go out into the church basement. 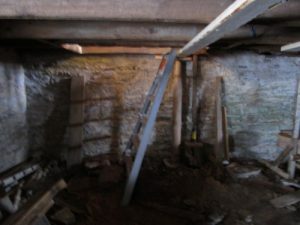 As the floor in this basement is still dirt and rather uneven the total rise could not be overly accurate, but after measuring in a few places you can come up with a figure that is fairly accurate. There are many automatic stair calculators on the internet you can use once you know the total rise. 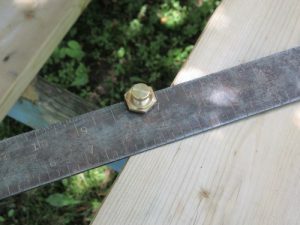 A comfortable step height is usually seven inches, but can be a little one way or another and the thread depth is often ten and a half inches with the thickness being inch and a half in this case. Once you have all the calculations figured out you can use a square to mark off the stringers. The stringers are usually two by twelves or two by tens. A set of stair gauges that attach to your square work very well, putting them at the height of the riser and width of thread. Also remember to cut off the inch and a half for the thread from the bottom of the stringers, which will make each step equal in height. 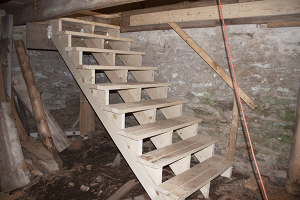 If your stairs are three feet wide is best to put another stringer in the center at the eighteen inches. You can use the cut outs from the first stringer to make this extra stringer with a two by six. Just line it up against the first stringer for accuracy, and screw your cut out pieces into it. Now that you have three stringers cut out and made it is time to fasten them below the finished height of the upper landing. In this case it is eight and a half inches down, and once the inch and a half thread is screwed in you have a seven inch step. You might have to add a two by six for support where the stringers will come. Also at most hardware stores today there are metal fasteners that can be used to support the stringers. 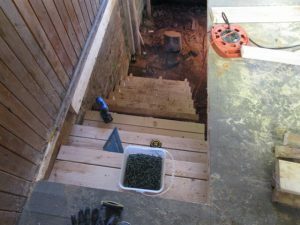 The next thing is to cut out the threads the planed width of your stairs and install them with screws. 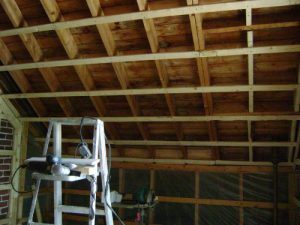 Usually the top two by six thread and the bottom are installed first and screwed down, as this is to insure the stringers are lined up right. You can also leave an inch overhang of the thread nose on the steps, and can be rounded off if you like. After your steps are all screwed down then its time to put up the handrail. 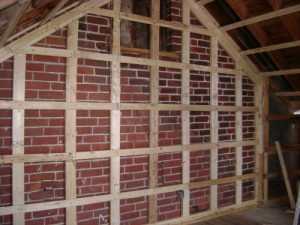 It can be supported with four by fours or two by fours that are attached strongly to the stringers, if there is no solid wall for this. The desired height of the handrail is thirty four to thirty eight inches measured from the top of the threads on your stairs. Handrails can be bought premade at most hardware stores, or you can make one out of a two by four if you do not wont something to fancy. Another thing to remember is to keep about eighty inches headroom where the stairs descend below the top floor, can hurt a little when your head hits the top floor. So you might have to extend the opening at floor level to give you the right amount of clearance. If the opening to your stairwell does not have a railing around it, then probably best to buy or make one and install. You can save someone from having a bad day.